Themeefy allows you to curate and collect web content and reflections in an e-magazine format. In beta, Themeefy is free though you do have to register to use the service. Click on “+Themeefy” to get started. You can also add text and images to pages. The video below walks you through the basic “how-to” of Themeefy. Provide clearer directions on publishing –when you get to the last step “Themeefy,” you have to click on “+Themeefy” to access sharing options. The icon “+Themeefy” is also used at the initial registration step so it’s not immediately clear that you’ll get to these options by clicking this button. Try a “Share” button instead. 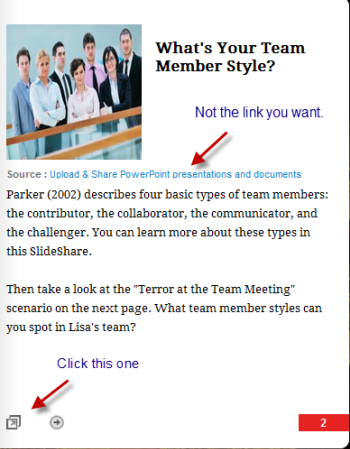 Make the link to the linked resource the first thing you can click. Right now, the most prominent link takes you to the resource home page. This snafu is illustrated below. To address this, I wound up adding a page of directions to my e-magazine. You can find a link to my Themeefy experiment here as well as resources for optimizing the performance of cross-functional teams. As Themeefy develops, I see this as a very useful tool. As an instructor you can use it to create modules of learning materials or study guides (take a look at the Themeefy library for ideas). For a more discovery-based learning approach, consider using it to create Web Quests or to incorporate scenarios with questions, as I did in my example. This is definitely a tool to watch.